March 27, 2019 (Redmond, WA) – B.E. Meyers & Co., Inc. is proud to announce that they are a Platinum Sponsor of the 2019 Shooter Symposium, a four-day training event slated for April 4-7, 2019 at The Ranch, a private shooting club in Eagle Creek, Texas. Over 150 students are expected to attend the symposium, which will be taught by eleven world-renowned firearms trainers, including B.E. Meyers & Co. Brand Ambassadors and night engagement experts, Bill Blowers and Chuck Pressburg. Both Mr. Blowers and Mr. Pressburg will be hosting basic night vision courses at the symposium where they will be demonstrating the functions of the B.E. Meyers & Co. MAWL®-DA, and MAWL®-C1+. The MAWL®-C1+ is the world’s first commercially available near-infrared and visible green laser aiming device using VCSEL based illumination technology. It offers all of the ergonomic, clarity, modularity, and interface enhancements of the MAWL®-DA, and provides greater near-infrared illumination distance than any FDA Class 1 laser on the commercial market. As a 45-year family business now in its second-generation of leadership, B.E. Meyers & Co., Inc. has maintained an end-user focus while continually innovating in the design and development of advanced photonic solutions. B.E. Meyers & Co., Inc. will be exhibiting their full line of Laser Systems and Warfighter Solutions at booth #20434 in the Law Enforcement section at the 2019 NSSF SHOT Show in Las Vegas, NV on January 22-25, 2019. The company’s Brand Ambassador Chuck Pressburg of PressCheck Consulting will be making guest appearances at their booth on Tuesday and Wednesday from 9:00am – 12:00pm, and Thursday from 1:00pm-4:00pm. Chuck, will be discussing the B.E. Meyers & Co. MAWL® (Modular Advanced Weapon Laser) series of individual weapon laser systems, and answering questions. B.E. Meyers & Co. Brand Ambassadors Bill Blowers of Tap-Rack Tactical, and Caylen Wojcik of Kalinski Consulting will also be stopping by the company’s booth during the show. Please watch B.E. Meyers & Co.’s Facebook , Instagram, and Twitter for updates. To schedule a meeting with the B.E. Meyers & Co. Team at SHOT Show 2019, please email info@bemeyers.com. SEMA 2018 finished last week, wrapping up the first year of B.E. Meyers & Co.’s participation in one of the world’s premier auto shows. While SEMA may seem an unlikely place to find a laser manufacturer, B.E. 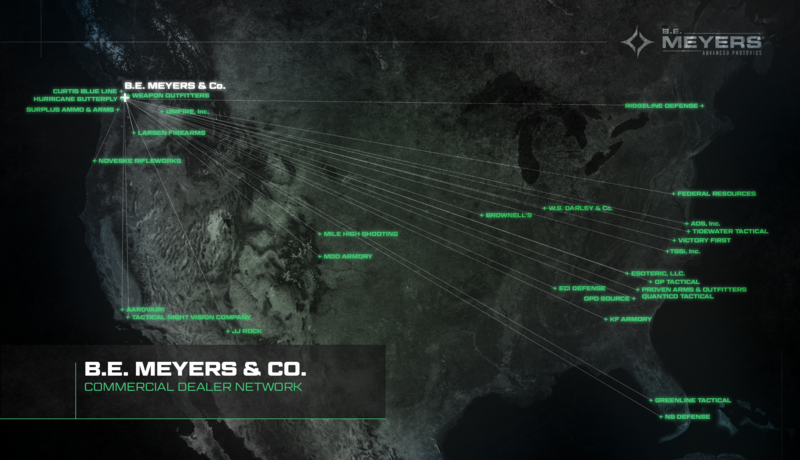 Meyers & Co., who is known for innovative defense and aerospace solutions, had something truly unique to share with the automotive industry. The “MAWLR”, a Lexus LX570 that B.E. 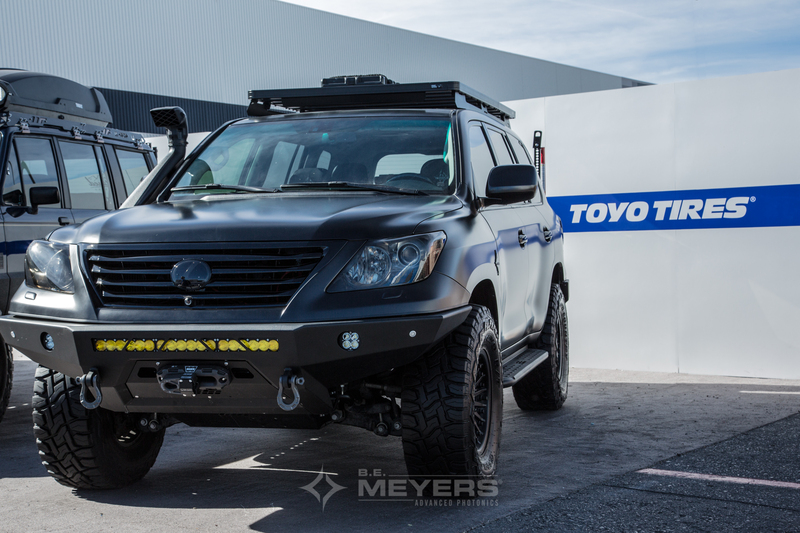 Meyers & Co. and Defconbrix transformed into the ultimate overland vehicle, was unveiled at SEMA in the Toyo Tires Treadpass. It is extremely rare to see an LX570 configured for off-road use, and none have a story quite like the MAWLR’s. When Sean Jennings of Defconbrix picked up the Lexus LX570 from B.E. Meyers & Co. in Redmond, WA last February, it was a completely stock vehicle with a long way to go before it would become the MAWLR. The Lexus had belonged to the late founder of B.E. Meyers & Co., Brad Meyers. To honor Brad’s adventurous spirit, and his legacy of ingenuity, Matt Meyers, CEO of B.E. Meyers & Co., decided to turn the LX570 into a project build with a unique vision. The MAWLR would parallel the qualities that make B.E. Meyers & Co. products successful, specifically the MAWL® (Modular Advanced Weapon Laser). As a company that focuses primarily on laser systems for night operations, the B.E. Meyers & Co. team needed a vehicle that could navigate the rugged Pacific Northwest terrain in low-light, and no-light conditions. The MAWLR is purpose-built to transport equipment to remote destinations for product demonstrations, testing, and photo shoots. The MAWLR is weapon ready, equipped with a TruckVault with designated space for rifle platforms, laser systems, and accessories. 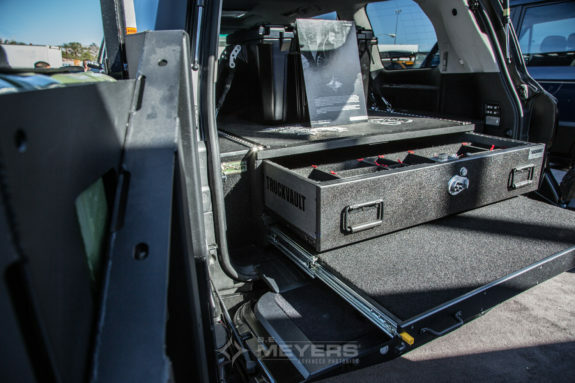 A large roof rack easily accommodates additional gear in travel cases. Custom armor, all-terrain tires, and all-wheel-drive ensure the MAWLR can make it from point A to point B in the varying climates of the Pacific Northwest. The MAWLR can transition from Washington’s snowy mountain passes, to wet rainforests, and sandy deserts, all without breaking a sweat. Whether demonstrating the latest laser technology, or shooting machine guns on a photo shoot, the B.E. Meyers & Co. team can often be found making magic happen during hours of complete darkness. Extensive aftermarket lighting on the front and rear of the MAWLR provide the lumens necessary to navigate to and from remote destinations at night. B.E. Meyers & Co. and Defconbrix will be revealing the official build list once the project is officially completed. The B.E. Meyers & Co. MAWLR build by Defconbrix can be followed on Instagram (@the.mawlr), and Facebook (@mawlr). B.E. Meyers & Co., Inc. will be participating at the Annual National Guard Association of Washington (NGAW) Industry Day on October 18, 2018. The event will be held at Camp Murray in Tacoma, WA from 0900-1400 in building 80, where B.E. Meyers & Co. will be showcasing their full line of laser and warfighter systems. Attendees are invited to visit the B.E. Meyers & Co. exhibit to see the MAWL® (Modular Advanced Weapon Laser) featuring their patented VCSEL technology; the GLARE® series of Ocular Interruption lasers for Hail and Warning; the IZLID® NIR and SWIR pointers and illuminators; and the BOARS®-M2 modular optic and accessory rail for the M2 series. They will also be displaying their full catalog of Flash Suppression Solutions. To schedule a meeting with the B.E. Meyers & Co. Team at NGAW Industry Day, please contact info@bemeyers.com. B.E. 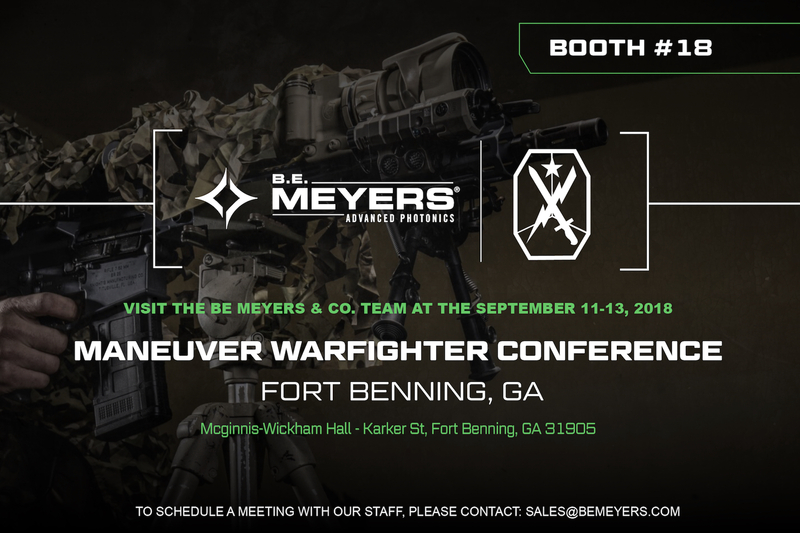 Meyers & Co., Inc. will be exhibiting their advanced laser systems and warfighter solutions at the Maneuver Warfighter Conference and Fort Benning Expo on September 11-13, 2018 at the Mcginnis-Wickham hall in Fort Benning, GA. Visit booth #18 to speak with the B.E. Meyers & Co. Team, and to see the Modular Advanced Weapon Laser – Direct Action (MAWL®-DA); the IZLID® series of laser pointers/illuminators; the GLARE® RECOIL weapon mounted Hail and Warning laser system; and the BOARS™-M2 optics and accessories rail for the M2 platform. B.E. Meyers & Co. will also be displaying their new M2A1F threaded flash hider for the General Dynamics M2A1 heavy machine gun. To schedule a meeting with B.E. 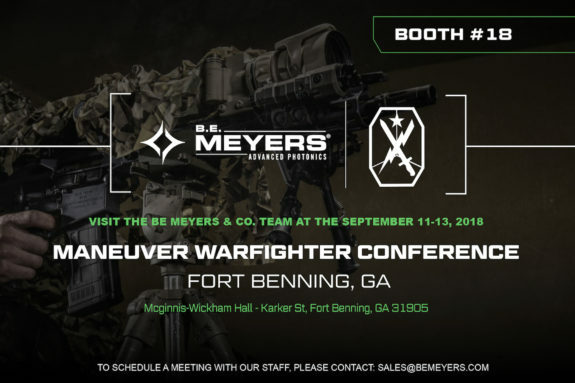 Meyers & Co. at the Maneuver Warfighter Conference/Fort Benning Expo, please contact sales@bemeyers.com. A Threaded battery cap that allows for replacement of the MAWL’s battery without tools. Redesigned remote fire ports for easy access when the MAWL is mounted to a platform. Performing a battery change on the MAWL is simplified with the EC2. Its threaded battery cap can be loosened or tightened by hand, and makes the MAWL easy to maintain in environments where time is critical, and small tools may not be available or practical. The redesigned geometry of the EC2 moves the remote fire ports to the top of the endcap and spaces them apart to facilitate quick access when the MAWL is mounted to a rifle. This extended spacing also provides additional clearance for any other wiring or accessories mounted to the platform. The MAWL is an inherently modular device, allowing for the three components, head, body, and end cap, to be easily swapped or exchanged. The EC2 is fully compatible with the entire MAWL family of weapon lasers, and can be purchased individually or as part of a complete MAWL. For more information about the EC2 visit www.bemeyers.com. This is too good. B.E. Meyers salutes the brave predecessors to the USSF. All kidding aside, you know B.E. Meyers is already cooking up some sweet space lasers and probably testing the efficacy of their flash suppressors in a vacuum. B.E. 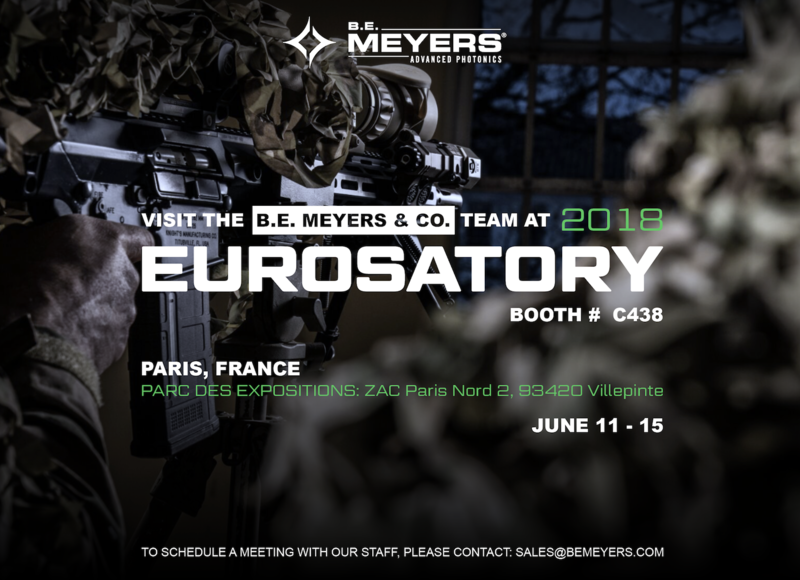 Meyers & Co., Inc. will be exhibiting at the Eurosatory Defense and Security International Exhibition in Paris, France on June 11-15, 2018. They will be located in the USA Pavilion, Hall 5A, at booth C 438. Guests are invited to visit the B.E. Meyers & Co. booth to speak with a Team Member regarding their Defense Solutions and Optoelectronic Custom Laser and Sensor Systems. * The MAWL(r) series of infrared and visible green weapon laser pointers/illuminators. * The GLARE(r) series of weapon mounted Hail/Warning/Illumination laser systems. * The IZLID(r) series of IR and SWIR laser pointers/illuminators for target marking and air-to-ground integration. * The BOARS(tm)-M2 optics and accessories rail for the M2 platform. * The M2A1F durable and compact flash hider for the General Dynamics M2A1 heavy machine gun platform. To schedule a meeting with the B.E. Meyers & Co. Sales Team, please contact sales@bemeyers.com.